Who is Marion Mahony Griffin? Last week we honored George Mann Niedecken as one of the first interior architects. Today during women’s history month, we honor Marion Mahoney Griffin who was one of the first licensed female architects in the world (and first in Illinois). She and Niedecken were important contributors to the Prairie School, and both of them made Frank Lloyd Wright’s work better. 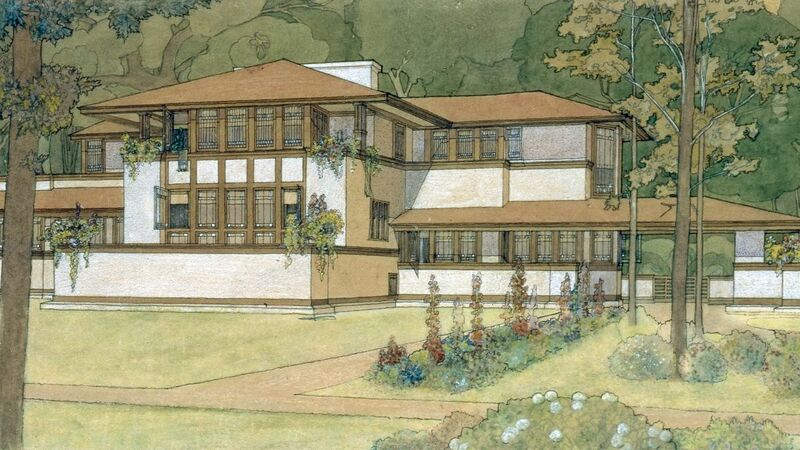 In the case of Marion Mahony Griffin, her best-known contributions to Frank Lloyd Wright’s work were her renderings (also called delineations). Her amazing beautiful watercolors of buildings and landscapes were only part of her contribution to work of Frank Lloyd Wright. As his first employee (hired in 1895) she designed buildings, furniture, stained glass windows and decorative panels. Like Niedecken, she was never given credit by Frank Lloyd Wright. Although Wright understated his team’s contribution to his work, when he eloped with Mamah Borthuich Cheney in 1990, he offered his local work to Mahony, but she declined and Herman V, VanHolst took over Wright’s projects with the amazing stipulation that she would Mahony control the design. She ended up designing many projects that Wright had abandoned, but for which he still got the credit. In 1911 Mahoney married Walter Burley Griffin, a landscape architect, beginning a partnership that lasted 26years. Her beautiful renderings of a design for Canberra the new Australia capital helped them win the competition. They moved to Australia where they not only worked on Canberra, but also many private commissions. The most impressive part of the story is that they developed the Knitlock construction method/ which was emulated by Wright in the textile block houses in California the 1920’s. Marion Mahony Griffin credited Louis Sullivan for the inspiration of the prairie school. Apparently, she thought that Wright’s habit of taking all of the credit hastened his early death. Its never too late to credit your inspirations, your mentors, your bosses, your employees, your consultants, even your challengers, who have made your work better. Happy Spring and Happy Women’s History Month. If you would like to work with a woman architect on your project, there are so many of us to choose from. Even if Leslie Saul & Associates Architecture and Interiors is not the right match for your project, I would be happy to guide you to one of our region’s outstanding architects, landscape architects or interior designers who will help you solve your design challenges with perhaps a great female perspective.